Fall into casual comfort with this upholstered chair. 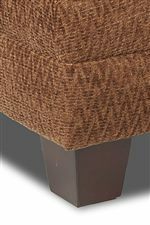 The attached back pillow will keep you supported, while the cushy arms only add luxurious comfort. The exposed wood block legs show off contemporary, casual style and are a perfect complement to the fabric. This chair will look great in a variety of home styles and will keep you cozy for years to come. 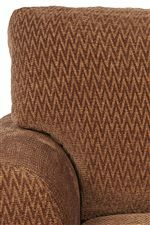 The Avery Casual Upholstered Chair with Attached Back Pillows by Klaussner at Van Hill Furniture in the Grand Rapids, Holland, Zeeland area. Product availability may vary. Contact us for the most current availability on this product. Fabric Options Available in over 1,500 fabric choices and over 300 leathers. Warranty Lifetime limited warranty on frames. 5-year limited warranty on springs. 1-year limited warranty on cushions and leather or fabric. Comfort and casual style are rolled into one in the Avery collection. Slightly rolled arms, attached back pillows, and exposed wood legs all show off casual aesthetics that will complement a variety of home styles. 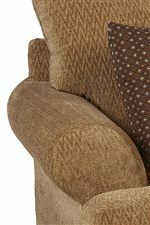 Add fun accent pillows to either piece to show off your individual style and truly make the Avery collection your own. The Avery collection is a great option if you are looking for Casual furniture in the Grand Rapids, Holland, Zeeland area. Browse other items in the Avery collection from Van Hill Furniture in the Grand Rapids, Holland, Zeeland area.